In Please Look After Mom, Korean author Kyung-sook Shin gives us a beautifully written (and translated) admonishment not to take our parents for granted. When an elderly mother (Park So-nyo) goes missing from the platform of a Seoul train station, her four adult children are plagued with guilt. Why didn’t they offer to pick up their mother from the station after her journey into the city from the country? Why didn’t they pay more attention to her after moving away from home? Why were they such ungrateful children? This technique brings much-needed dynamism to a story that mostly takes place inside the narrators’ minds in the form of memories and guilt-laden thoughts. Shin depicts the life of a family as a complicated web of ever-changing relationships. Never over-sentimental, Please Look After Mom succeeds as a sensitive and powerful examination of the selflessness of parental love. 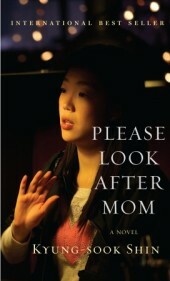 Please Look After Mom by Kyung-sook Shin (translated from the Korean by Chi-Young Kim) is published in the United States by Knopf.